Jamieson Price is an actor and voice over artist with extensive credits on stage, screen, and in interactive media. He appeared with Jason Isaacs and Mel Gibson in The Patriot, and has been a guest star on Westworld, Frasier, Days of Our Lives, Without a Trace, and According to Jim. He also voiced the recurring character Dark Mayhem on Nickelodeon's The Thundermans. His voice acting career has been long and varied with well over 200 credits in television, anime, video games, and audio books. He is the announcer for Mortal Kombat 9 and X. He is the voice of Gulper - a Skylanders villain, the male Monk in Diablo III, Colonel Miller in Metro, The Commander in Monster Hunter World, Garen in League of Legends, Lu Bu in Dynasty Warriors, Ovan in .Hack, Ryder in Fate Zero, Second Hokage in Naruto, Chad in Bleach, the Count of Monte Cristo in Gankutsuou, the Colonel in Akira, and Duke Red in Metropolis. In addition to these memorable roles he voices a wide variety of characters in multiple campaigns of World of Warcraft, as well as Hearthstone, and Starcraft 2. Other credits include Last Man, Hunter X Hunter, Bungo Stray Dogs, One Punch Man, Berserk, Digimon, Pokemon Origins, Ever After High, Dragon Ball Super (Asia version), Mobile Suit Gundam: Iron-Blooded Orphans, Halo Wars 2, Fire Emblem Heroes and so many more. In addition to his work on screen and in the recording studio, Jamieson is an accomplished stage actor. 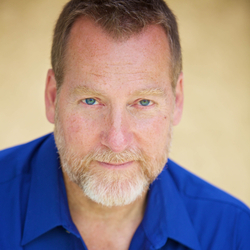 Jamieson was recently heard as the Voice of God in LA Opera's bi-annual production of Benjamin Britton's Noah's Flood at the Cathedral of Our Lady of the Angels in Los Angeles. Other recent performances include the Visions and Voices series at USC's Fisher Museum and Ira in The Tale of the Allergist's Wife with the Cal Rep Company on the Queen Mary in Long Beach. Jamieson is also a professional name reader, announcing the names of thousands of graduates at commencement ceremonies at California State University Long Beach, California Polytechnic University - San Luis Obispo, and Chapman University in Orange, CA. He received his MFA in Acting from California State University, Long Beach - where he played Macbeth, Mordred, and a host of other extremely varied characters. His stage work also includes leading roles in nine summer seasons of the historic Ohio outdoor dramas Blue Jacket and Tecumseh. But his most important role is proud father of two grown daughters and a 14-year-old son.